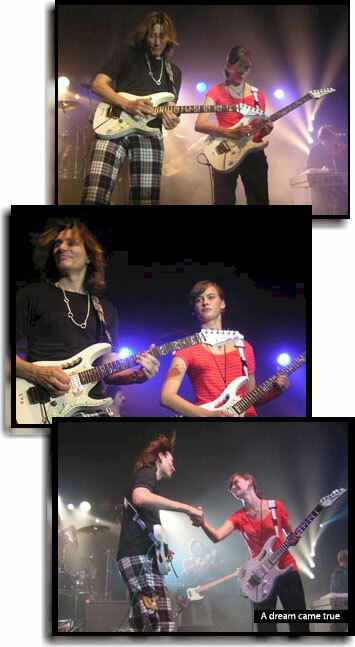 At 12 years old Yasi discovered the amazing Steve Vai and began playing the guitar. The song Yasi shares with us in this video is her rendition of Steve Vai’s ‘Tender Surrender’. If you aren’t familiar with Steve Vai, let me clue you in so the story makes more sense, he is regarded around the world as one of the all time guitar virtuoso’s, capable of seamlessly blending classical music and rock into a style all his own. Now, back to Yasi’s story… Yasmin liked the guitar, but more than that, she liked the magic of Steve Vai (hey, who doesn’t) and decided that she wanted to play like him. Of all the styles, she decided to emulate the man regarded at the absolute best… The only problem, SHE WAS JUST 12 years old! When I heard Yasi playing this piece I thought it was a fake, it was just too good! So I did some research and found out she’s the real deal! Plus, she’s not even 16 years old in the video! Her age comes through in her performance, the song carries a youthful, playful spirit unlike Vai’s rendition… Her rendition, is without question, enjoyable on every level… But add to that the fact that’s she’s only played for three years, and well, Mr. Vai himself took notice and invited her to share the stage with him! These days Yasi spends her time practicing and playing gigs, making her Living Dream a reality each and every day… Thanks Yasi! Today you’re our inspiration for what dedication and determination can accomplish!